The football field at Granville Central School is named after him. A prestigious annual award is given in his memory. Any conversation regarding Golden Horde football past always includes Sam Eppolito. 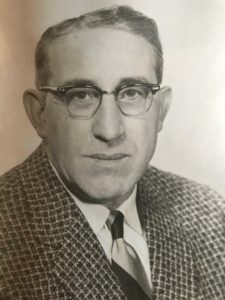 “His remarkable contributions to Granville athletics continue to be the topic of conversations whenever discussions of Granville’s past athletic endeavors come up,” retired Granville athletic director Eileen Troy said in the biography she wrote for the program at the Capital Region Football Hall of Fame induction on Aug. 4. The legendary football coach will be inducted into the Capital Region Football Hall of Fame as a member of the ninth class of the organization. Eppolito was the beloved coach of the Golden Horde from 1926-1956. He coached six undefeated teams with two perfect seasons, in 1930 and 1933. His teams were outright Northern Conference champions 11 times (’29, ’30, ’32, ’33, ’34, ’36, ’37, ’43, ’46, ’48 and ’49) and co-champions three times (’42, ’44, and ’45). Eppolito’s 1932-1935 teams compiled a 28-game win streak. From 1928 to 1934 they were undefeated on their home turf.